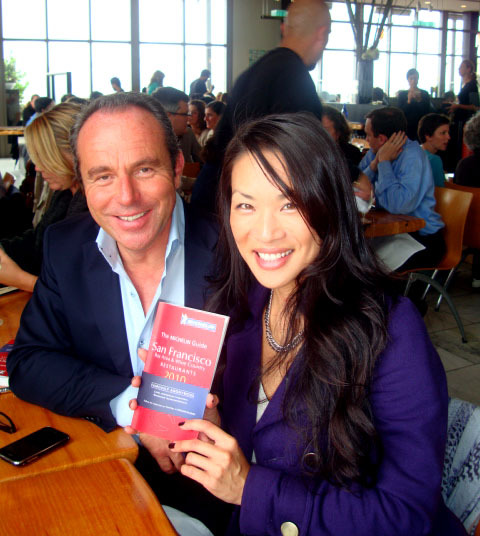 I had the pleasure of recently dining with MICHELIN Guide Director, Jean-Luc Naret and wanted to share some interesting and insightful facts about the “famously anonymous” and coveted MICHELIN Stars and Guide which went on sale in the U.S. this month in New York and San Francisco. 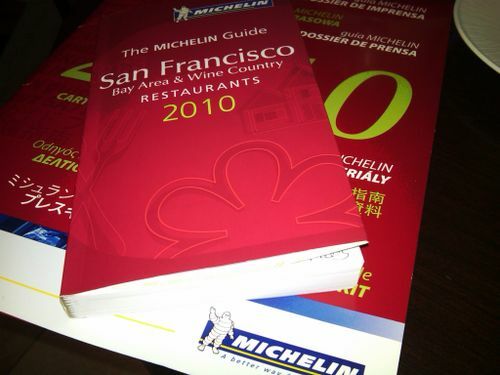 The MICHELIN Guide was first published in France in 1900. It was originally a small, 400 page red guide which was distributed free of charge to motorists which contained a wealth of useful information on topics such as changing tires and maintaining vehicles. Throughout the years, it has developed into a 2,000 page guide covering approximately 8,500 establishments with the goal of making traveling easier. It has also become the pinnacle benchmark in gourmet dining. Whenever I travel to spots like Tokyo and New York, I always bring my MICHELIN Guide in hand for recommended dining destinations. Although the MICHELIN Guide may be thought of as the red guide of the cream of the crop and uber pricey white table clothed restaurants, the MICHELIN guide also contains a Bib Gourmand category – “Inspector’s Favorites for Good Value”. The Bib Gourmand features restaurants serving a meal (2 dishes and a glass of wine and dessert) for $40 or less. In the San Francisco Guide alone, there are 62 of those delicious dining options. In New York, there are 85 recession-proof Bib Gourmand dining spots. The New York Guide also showcases 109 restaurants offering a meal under $25. MICHELIN Guide director, Jean-Luc Naret notes that “During the current recession, value for money is more important than ever”. 3) The Chef’s personality is revealed through his/her cuisine. -Why have the MICHELIN Guides to Austria, Los Angeles, and Las Vegas been discontinued? Because of the current economic environment, the L.A. and Las Vegas guide will not be released. The Guide’s next destination in the U.S. will not be announced this year. Austria has been discontinued due to the economic conditions and consistent poor sales. -There’s NO magic formula for earning a MICHELIN Star. Chefs should focus on satisfying customers by serving them high-quality dishes. -When a chef receives a MICHELIN Star in the U.S., it is comparable to receiving a MICHELIN Star in Europe and other MICHELIN Starred cities. A restaurant that has been awarded one or more stars is not only among the best in it’s city or country but in the entire world. -Chefs say that the MICHELIN Guide is the only independent international benchmark that allows them to situate themselves relative to each other. Regardless of their nationality or type of cuisine, chefs also know that being selected for the MICHELIN Guide is in itself a sign of quality because only the best restaurants in each comfort and price category are included. -Regardless of the country or city covered, the MICHELIN Guide reflects the local fine-dining environment. The Guide’s purpose is not to point to future trends but only to note what is being done at the time. -The MICHELIN Guide collection is comprised of 26 Guides covering 22 Countries and will resolutely pursue it’s international development in the future. -MICHELIN Guide inspectors are anonymous and in ways their privacy is like the witness protection program – but with much better food! Very Interesting Piece Mika. I always wondered how stars are awarded and your write up is closest to explaining that I have found. Keep up the excellent writing.